Blitz question: what do geckos and the Grippy Pad accessory have in common? The answer is that both of them have mastered the art of microsuction. 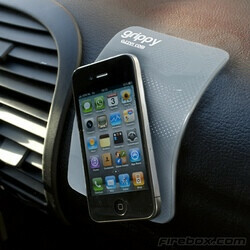 As if by magic, the Grippy Pad can stick to a wide range of surfaces, and the dashboard of your car is no exception. And thanks to the miniature suction cups that Grippy's surface is covered with, you can easily stick a smartphone or a tablet to it without worrying that the device is going to fall off. Sounds cool, we have to admit. But what is even cooler is that the Grippy Pad requires no adhesives of any kind, meaning that it does not leave any traces once you decide to peel it off. And since it is resistant to sunlight and doesn't wear off, meaning that it will serve you well for years to come. Not bad for an accessory that costs about $11, right? If you are still not convinced, check out the impressive video demonstration available at the link below. that is neat. the iphone is pretty light and has a completely flat surface. how would this thing do with a curved back? or with a textured surface or case? someone let me know if this works on the gnex due to its textured back. Listen Chuck Norris, you can do anything. We don't need to let you know anything, you need to let us know what we need to let you know. lol But all kidding aside, I would like to know because I too have a GNex! Sometimes i hate always being right and having all the answers you know, so i leave room for normal people to participate. At first, I thought it was some pad I saw before. After reading the article, it truely is something new. Post the results after you receive it please. I would like to order, but I'm iffy on new things. It works fine. In fact I just ordered two more for may wife and her sister. Holds my sun glasses and holds my iPhone but will not hold the iPhone if I go beyond 180 degrees.